Description: • Compatible with both the Game Boy and Game Boy Color Systems. Box Text: Flash back to the '80s with original and updated versions of five Game & Watch hand-held games! Relive the birth of hand-held gaming in Classic Game & Watch games. Then join your favorite Nintendo characters in Modern versions featuring improved play control, graphics, color and sound! Egg - Catch your eggs before they hatch! Turtle Bridge - Carry the packages across the turtles' backs! Green House - Protect your plants from the pesky pests! Mario Bros.™ - Help Mario® & Luigi keep the factory flowing! Donkey Kong JR.® - Grab the key and free DK™! • Save & Quit feature lets you stop and restart your game anytime! • Battery-backed memory saves all your scores! • Collect stars to access new features and open hidden classic games! Game & Watch Gallery 3 is a re-creation of classic Nintendo games and has no time-keeping function. 06-08-2016 Flashback2012 Description • Compatible with both the Game Boy and Game Boy Color Systems. • Supports Game Link® cable. 06-08-2016 Flashback2012 Box Text Flash back to the '80s with original and updated versions of five Game & Watch hand-held games! Relive the birth of hand-held gaming in Classic Game & Watch games. Then join your favorite Nintendo characters in Modern versions featuring improved play control, graphics, color and sound! Egg - Catch your eggs before they hatch! Turtle Bridge - Carry the packages across the turtles' backs! Green House - Protect your plants from the pesky pests! Mario Bros.™ - Help Mario® & Luigi keep the factory flowing! Donkey Kong JR.® - Grab the key and free DK™! • Save & Quit feature lets you stop and restart your game anytime! • Battery-backed memory saves all your scores! • Collect stars to access new features and open hidden classic games! Game & Watch Gallery 3 is a re-creation of classic Nintendo games and has no time-keeping function. 01-12-2012 omegamustard Box Text Flash back to the '80s with original and updated versions of five Game & Watch hand-held games! Relive the birth of hand-held gaming in Classic Game & Watch games. Then join your favorite Nintendo characters in Modern versions featuring improved play control, graphics, color and sound! 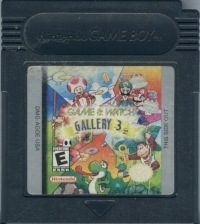 This is a list of VGCollect users who have Game & Watch Gallery 3 in their Collection. 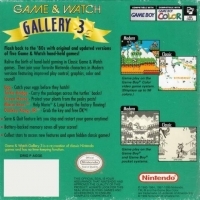 This is a list of VGCollect users who have Game & Watch Gallery 3 in their Sell List. 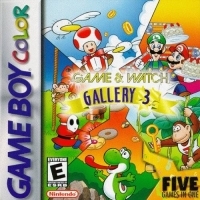 This is a list of VGCollect users who have Game & Watch Gallery 3 in their Wish List.